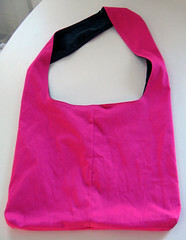 i used this tutorial and hot pink twill and forest green corduroy. i lengthened the bag to 15" deep. the tutorial was pretty easy to follow and i would definitely use it again. it's the perfect size for work.